Welcome to A Stay in Fife - our exclusive collection of unique guest houses, B&Bs and self-catering accommodation in the historic Kingdom of Fife on the east coast of Scotland. Whether you're planning a short break or a longer visit, our members offer reassuringly high standards of hospitality. Family owned and one of a kind in the best possible way, many of the quality properties in our specially selected portfolio have en-suite facilities and are pet friendly. You can stay in a working farmhouse in beautiful countryside, an elegant town house, a luxurious country house, a cosy cottage in a picturesque village, or a relaxing home overlooking the sea. The options are endless and you'll find us in ideal locations throughout Fife. 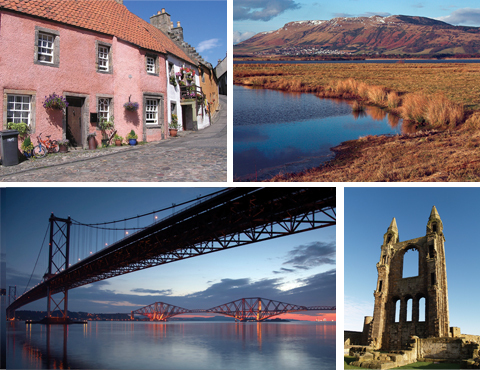 We're ideally placed for St. Andrews, Cupar, Falkland, Kinross, Glenrothes, Dunfermline and Kirkcaldy and within easy reach of popular destinations like Edinburgh, Dundee, Perth and Stirling. Elendil: Please call or email for our current special offers. Cherry Tree Lodge: Book 6 nights and get the 7th free! The Steadings: Discounted long stay rates available by arrangement.